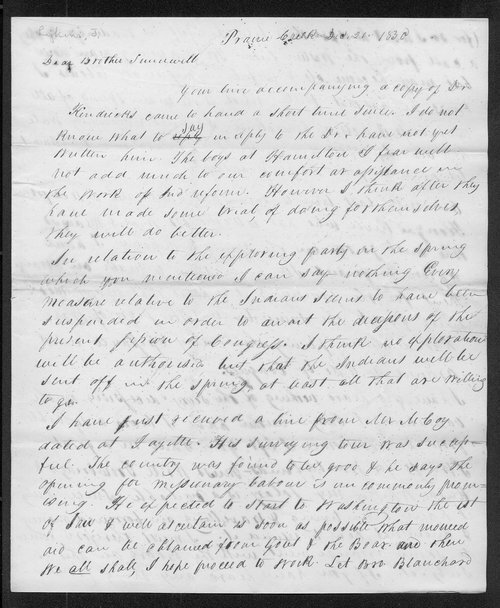 In this letter to Robert Simerwell, Johnston Lykins relates some of his activities in the late fall and early winter of 1830, most of which concerned the efforts to ready the local Native Indians for the move west of the Mississippi. Lykins states that, while at Logan Fort, he met a Wea from the Kanza River who had "collected 100 Weas & Miamis who will go on in the spring to Missouri." Lykins then explains that he plans to see the Wea soon so that the two of them can make arrangements for the 100 Native Indians that were ready to leave the Michigan Territory for the "West."